Thank you for visiting wisnercontrols.com. We are committed to protecting your privacy and understand any concerns you may have regarding your personal information. We do not rent, sell, or share any customer information, including your e-mail address, with third parties under any circumstances. Any information we request is used solely to provide our services to you. The following describes our privacy policies. We collect and store information from you and your purchases, such as your name, address, phone number, email address, drop ship addresses, credit card information and the items that you purchase. The information we gather is used to fill your order, send you requested information, or contact you again regarding price changes, new products, or feedback that helps us respond to your needs more efficiently. If at any time you would like your information purged from our system, you may simply request that we delete all of your information. The transmission of information is encrypted and protected using the most advanced Secure Sockets Layer (SSL) technology. This includes the submission of any payment information such as credit card details. If you are uncomfortable using your credit card on the Internet, we understand. You may call us toll-free with your credit card number to complete your order at 1- 800- 262-7210. Wisner Controls does not employ the use of spam for promoting its products in any way. Our website contains some links to other websites. 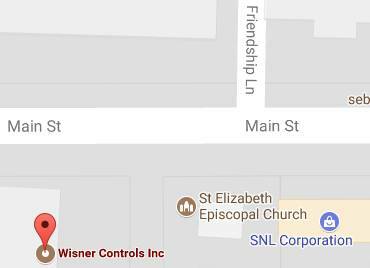 Wisner Controls is not responsible for the content of these sites. These links to other web sites are provided solely for information that may be useful to the users of our web site.